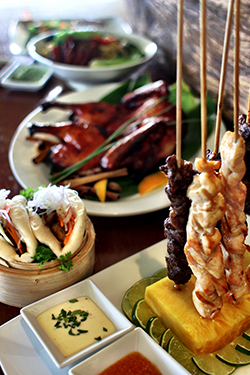 For the first-time, taste, experience and enjoy the Street Foods of Asia “Kahala Style” at the resort’s seaside event on the lawn of Plumeria Beach House on the evening of Friday, September 9. Taste, see, feel and hear the sizzling sounds of the markets in Asia at the most spectacular location in the world! The Kahala will offer a fun food and drink selection of Wok Fried Garlic Prawns, Naan Bread with Ahi Dip, Cucumber Raita and Roasted Tomato Chutney, Satay Skewers, Indonesian Corn Fritters, Dim Sum with Tsingtao and Taj Mahal beers, Sparkling Rose, wines and much more at various ‘street stations’ on the resort’s lawn. Global art, music and entertainment will also be offered at the event. The Kahala’s Asian Street Food experience on Friday, September 9 is from 6–9 p.m.The beachside evening event is priced at $80 per person and $37.50 for children ages 6-12 inclusive of food, beverages, tax and gratuity. Note that the regularly scheduled Best of Kahala Buffet will be cancelled in place of the special event. For reservations and more information, call The Kahala’s Dining Reservations at 808.739.8760 or visit https://www.kahalaresort.com/Dining/Dining-Offers-Favorites. The legendary Kahala Hotel & Resort is an oceanfront, destination luxury resort known for its gracious Hawaiian hospitality. Located just minutes from Waikīkī, The Kahala offers an exclusive ambiance of a neighbor island experience. The hotel is home to The Kahala Spa, Plumeria Beach House, Seaside Grill, The Veranda, Arancino and the award-winning Hoku’s restaurant. The Kahala has been Honolulu's social address for weddings and gatherings since its opening in 1964. World leaders, royalty, rock bands and Oscar winners call the 338-room resort their Hawaiian home-away-from-home. The Kahala is a member of The Leading Hotels of the World and Preferred Hotels & Resorts.